This tutorial is dedicated to pattern #1. This tutorial is supposed to teach you how to tie normal pattern #1, the striped and easiest one. If you want a printer-friendly version in PDF, click here. To make this bracelet, you will need yarn or embroidery thread in different colors. In this example I've used 8 strings. The length should be about 65" if you fold the strings in half. If not, then 30". Above you see a solution for starting. Start with the string on the left. 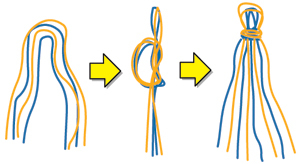 Make a forward knot as the picture shows, and tighten it. If you've done it right, it will look like this. 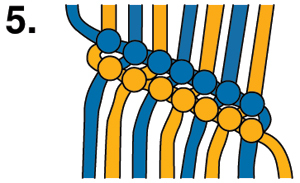 Continue to make forward knots with the same string on the next string in line. Do so on every string until you've made one row. Now you take the string out on the left again, and do the exact same thing as in steps 1 to 3. After two rows it looks like this. Go back to step 1 and continue like that in the same way until the bracelet is long enough. Cut two strings of different color, about 65" long each. Next fold them in half to make about a 1/4 inch loop at the top. Arrange your strings like this: 1234. 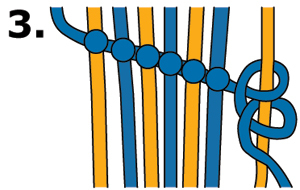 Let's say color one is strings 1 and 3, and color 2 is strings 2 and 4. 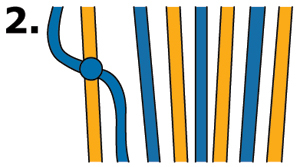 Tie a FK (forward knot) with string 1 over 2, 3 and 4. Now the strings will be in the order 2341. Tie a FK with string 2 over 3, 4 and 1. The strings will be ordered 3412 after this step. Tie a FK with string 3 over 4, 1 and 2. Your strings will now be arranged as 4123. Tie a FK with your string 4 over strings 1, 2 and 3. Your strings should now be in the same order as you started. Repeat steps 2 to 5 until the bracelet is long enough. Looks good with: Any number of strings (6+ looks best). This tutorial will teach with: 6 strings, 6 different colors. You need to know how to do: Forward Knots (f/k). 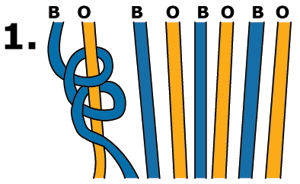 REMEMBER: TIE DOUBLE KNOTS! It helps that you know how to make the: The Diagonal/Candy Stripe on this website. 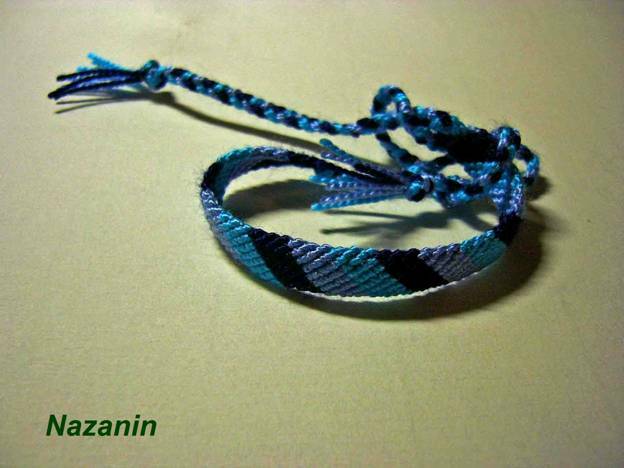 Other Info: This is the basic friendship bracelet and is very quick to make. Step 2. Tie a f/k with the red string on orange. Then tie anther F/K with red on yellow. Repeat this until red has been tied all the way across the other strings. Remember to tie double knots. Now red should be on the right side of your strings. My 5 stringed Sweets Candy Stripe. My 8 stringed Rainbow Candy Stripe. My 4 stringed Lime Water Candy Stripe. You need any amount of strings (6 looks best) that are all different colors. Number 123456. Step 1. Take string 1 and make a foward knot on string 2. Now the order is 213456. Step 2. Take string 1 and make a foward knot with string 3. Now the order is 231456. Step 3. Keep doing that with string 4,5,and 6 so that string 1 is last. Now the order is 234561. Step 4. Repeat step 1 - 3 with string 2. When you're done with that, do all the other strings. That's how you make the bracelet! 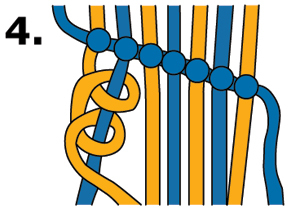 Step 3:Now you take the orange and make a forward knot on the yellow, green,blue,purple,red,orange,yellow,green,blue, and the purple. [p]Thanks to Stefan for this video. The original author of this tutorial is Stefan, but it has also been edited by Foz, Jeckle, Sareana, WiccanMama, AdiK, HarleyMama23, gracebri, Kestrel, Alicat, K4yk4y101, Kair5 and mysterytour. The tutorial was last updated 4 years ago.